One notes a similar pattern on the Republican side of the barricades. Two Republicans in particular, Co-President Pro Tem of the Senate Len Fasano and Republican leader in the State House of Representatives Themis Klarides have valiantly fought what Republicans would consider the good fight, but neither of them were willing to throw their hats into the gubernatorial ring. And so, we are left with Democrat Lamont and Republican Stefanowski, two wealthy businessmen of limited political experience, vying for governor of a failed state. Malloy has weakly defended his administration, but few Democrats running for office this term would want to campaign cheek by jowl with a governor whose approval rating is at sub-basement level. The large open question is: Will Lamont continue in the way of Malloy? On the stump, Lamont has pointed out that he ran for governor against Malloy, slyly implying that his administration will depart in important respects from Malloy’s ruinous policies. But in fact, the similarities between the Malloy and Lamont programs are startlingly striking. Both are tax-prone politicians, people whose instinctive reaction to repetitive budget deficits is to raise taxes and negotiate short-term spending cuts with powerful union leaders. Connecticut’s economy has now reached the point of diminishing returns, a dangerous fork in the road in which increased taxation yields less revenue for the state. When Lamont ran against Malloy, by far the better campaigner, he was not agitating for permanent, long term spending cuts, reductions in broad based taxes, or measures that would alarm the fragile sensibilities of powerful union leaders. Among Democrats, unionized state employees have become both the third rail of Connecticut politics and an unelected fourth branch of government. Lamont, like Malloy and other big spenders, is tireless in discovering new ways to milk the tax cow without causing it to fly the fence; for tax cows have wings and are unusually mobile. Lamont has proposed a toll tax on heavy duty trucks, which will require the installation of gantries on major highways in the state. Tolls represent a new mode of taxation, an add-on tax that may be applied in the future to overtaxed travelers who do not drive heavy trucks. Among change resistant nutmeggers – not excluding, of course, the state’s non-partisan media, most of which has been long committed to progressive governance – the common effort involves erecting barriers that will prevent ANY net tax reductions. “Fixed costs,” to cite but one example, is such a barrier. Fixed costs are fixed, pun intended, by making it less likely, if not impossible, for future legislatures to reduce costs and thereby reclaim, chiefly from unions, a legislative prerogative that belongs constitutionally to the General Assembly. Malloy has fixed the contractual terms he negotiated with union heads out to 2027. 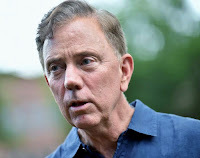 A future governor of Connecticut – be he Lamont or Stefanowski – will not be able to adjust state employee salaries and benefits until state government is effectively bankrupted or the terms of the Malloy/SEBAC negotiated contracts run out nine years hence, whichever comes first. It is not Malloy’s shadow, but the substance of his policies, un-repudiated by Lamont, that casts a doom over Connecticut. Indeed, Trump’s economic policies – reduce marginal taxation, increase military procurements, which languished during the Obama administration – have had a pronounced beneficial effect on job creation in Connecticut. The great flaw in Trump’s ointment is inattention to spending increases. Connecticut’s inattention to spending has produced a myriad of unaddressed and long festering problems. We are six states below the highest taxed states in the nation, the only state in the nation that has lost population, and the “Great Recession,” which ended years ago everywhere else in the country, continues to gore us. We are one recession away from absolute collapse, unless voters in Connecticut, during the off-year presidential election, send a clear message to the architects of our discontent – and vote for real change.